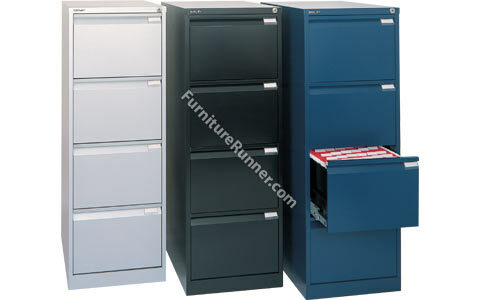 The 4 drawer version shown in Silver, Black and Oxford Blue. Bisley Flush Front Filing Cabinets are built to last and feature a fully welded construction and double skin drawer fronts for strength and durability. Featuring 100% drawer extension - Pierced back and sides to enable units to be bolted together - Fully welded carcass without bolts or rivets for greater strength and cleaner lines - Compressor plates available to divide drawers. The 4 drawer versions can accept 2.22m of filing. The drawers slide out in a progressive action thanks to smooth ball bearing slides. The drawer fronts are double skinned and the carcass is one piece for extra strength. The welded corners mean no sharp edges.